What a great experience. 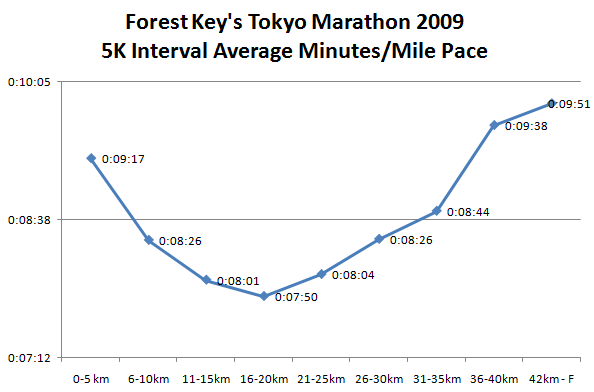 First some context, a marathon is 26+ miles, or 42.165 km. I ran my first and only other marathon in Los Angeles 2 years ago, with my brother Andy and friend Adam Brownstein, and while the experience was ultimately fantastic/wonderful, that race was a ball buster because of a surprisingly warm March 4 in Los Angeles, with temperatures over 80 degrees on the race course (the street reflects heat back up in your face!) In that race, despite training very hard for many months and feeling physically ready, i hit the proverbial “wall” very early in the race, at about mile 17, and suffered a combination of heat fatigue and cramping as we limped along at my reduced capacity, finishing in a 4:32:00 or so time, well beyond our stated goal of 4:00:00 or less. 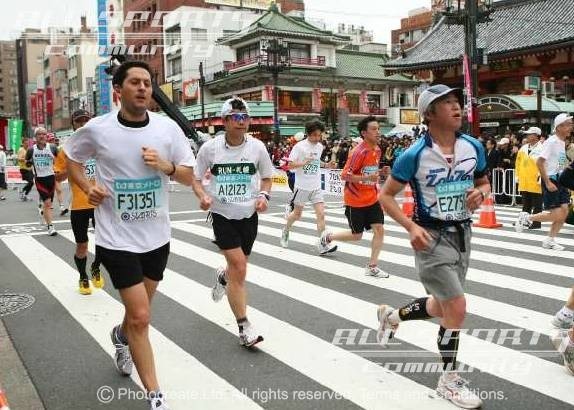 So, fast forward two years and here i am in Asia, and it occurs to me that it would be a good experience to try to run another marathon, to achieve my lifelong goal/ambition to do a sub 4:00:00 marathon (i had trained twice for the San Francisco Marathon, when I was in my 20s and weighed a good 25-30 pounds less than I do today, and despite being in great running shape, both times I was sidelined by illness or injury in the very weeks leading up to the race 😦 ). The problem is, as you might have guessed, that the Beijing air is absolutely, beyond belief, god *awful* and no outdoor training would be possible… and certainly i would not want to run an actual marathon in most major chinese cities. There is an intriguing “great wall marathon” which includes a large section on the great wall, but that course is not the kind of course i could aim to break 4hrs on, given the ridiculous altitude changes, and unsteady surface of running on the wall. 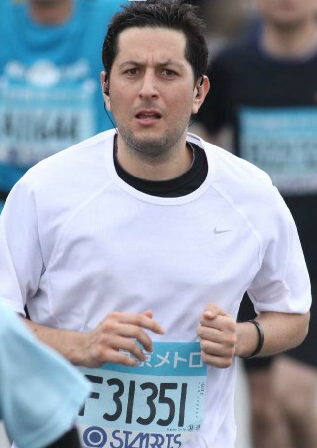 So while in tokyo on a business trip, i stumbled upon the fact that the Tokyo marathon was being held March 22nd in 2009, and i valiantly entered into the lottery to see if I could get a slot. Apparently, 260,000+ people applied for a chance to run this year, and I was one of the lucky folks to be awarded a position in the race, making me one of 35,000 privileged runners on race day today. When I got the notification in october that I had been selected, i immediately told myself “well, that settles it, i HAVE to run…”, as the slot was awarded to me and divine providence was weighing in. The problem, is that for the entire month of October and much of November, i was suffering from a really bad/painful plantar wart on my right foot, and running exacerbated the pain, leading to me having a pronounced limp and eventually not being able to walk at all! It was exactly while I was in this condition that I got my notice… so while I knew i must train/run, i had to first attend to a series of painful cryo-surgeries (freezing) on my foot, which further debilitated me for a good 6 weeks. It wasn’t thus, until December, that I finally could start running regularly, giving me just Dec/Jan/Feb and early march, 3 months, to get into marathon shape. So, with a real sense of urgency, i through myself religiously into training, on TREADMILLS in our house/basement, at our Villa complex’s gym, and at hotel gym’s as i travelled to Korea, Tokyo, London, Paris, Munich, and Redmond USA. In my entire training, i did only 4 runs outside on cement, 2 in beijing (after days when it had rained and temporarily cleared the air and revealed the blue sky) and in San Francisco, where i tested myself on a 18 mile course that Adam Dawes and I had run together back in the 90s as we trained together for the San Francisco Marathon (which I never ran as mentioned earlier). Alive 2007 – Daft Punk; this live album, 80 minutes long, of awesome techno/beat music, is my muse. The music and I have come a long way together, with so many runs listening to this stuff, i’ve come to love it like religion. PDA – Interpol; this was a late addition to the playlist, as I only learned of this song/group in the last month or so, while playing RockBand2 with the family on the Wii. It is a great song, and today when it came on, at the 20km mark on the track (approximately half way), it brought a big, silly, sh*t grin to my face. A few songs from Gnarles Barkley’s second album, then follow, before dumping me into the complete Dark Side of the Moon – Pink Floyd. This Floyd comes during the beginning of the “DARK” period of the run, entering the phase called “the wall” at mile 18-22 or so. In training when I did my long runs, i just focused on getting past this album to the song that came after it, which would bring me to 3hrs and that’s plenty during training. The playlist continues, of course, all the way to 4:20:00 or so (in cae I have another bad experience and need some music to get me over the finish line past 4hrs). However, i built the playlist back in december and never heard it till today, which brought many uplifting/music inspired positive moments during the hardest last hour of the run. treadmill is bouncier than cement, and on a positive note it spared my feet some of the damage that I took 2 years ago, when my feet were pretty much trashed for as much as 6 months after the run (the usual, toes swollen, toenails fell off, etc.—par for the course for long distance runners). On a positive, it seemed like the monotony of the treadmill would get me into really good mental condition—on race day there is all kinds of things to look at, thousands of people, good crowds, music and revelry… it seemed coming into the race that those distractions, coupled with my Buddha-like ability to mark off the hours while staring at a wall or a mirror in the gym, would make for a happy mental/emotional day on race day. However, the lingering worry was of course that the hard cement would beat my bones/joints and that the lack of training for that would leave me wounded/defeated mid course on race day. So, couple of thoughts about this event in particular: the Japanese are amazing at organizing and structuring things, as anyone who has visited this marvelous country knows. The starting blocks were so well organized, it made the LA Marathon starting line look like it was run by a motley crew of high school students/amateurs. In Los Angeles, it took nearly 25 minutes from when the starting gun was fired, to when i crossed the starting line, and we were in the middle of the pack (by comparison, the LA race had only 24k runners, Tokyo today 35k). Today, i’m pretty sure all 35k of the runners had crossed the startline within 10 minutes of the gun being fired, my group in approximately 4 minutes. The course was really well maintained/marked, there was lots of volunteers everywhere, porta potties, fluids and food. Spectacular—really an amazing world class event (as should be expected of this great city); interestingly, Tokyo is trying to get the summer Olympics in 2016, and it is said that this metropolitan marathon in many ways is done in order to show that it has the stuff to organized such activities in the middle of the metro area. The subways handled all the traffic, as the city was basically shut down to cars throughout the morning, and when i took the subway home after the finish line, everything was humming along. There were thousands of people around me the entire day. The course is relatively narrow, so for the entire first 40km or so, it was wall to wall people, and I constantly had to be on the lookout to not trip on someone or trip someone in front of me. This made for a exhilarating, if stressful, RACE like feeling. I never felt alone out there, and kept pace with 3 or 4 guys that i saw during most of the 2nd half, who either would pass or be passed by me as we clearly ran a very similar time/pace. I was running a blazing pace, faster than any of my training runs. I had really good energy, and was able to sprint around people and really dig in. Most exciting to me and something that really lifted my spirits, is that at the dreaded 32km mark, i really felt good, and i was able to push through all the way to km 37 or so before I really felt any fatigue or "i’m ready for this to be over with already” kind of dread. I never hit “the wall”, unless you can call the 20mph headwind that blew into us, during the last 3 miles or so, on 2 separate uphill sloaps no less, a wall! 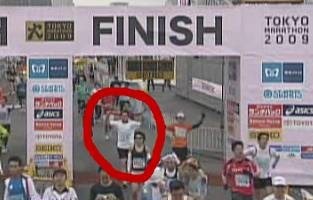 That definitely slowed me significantly, but I kept my arms a pumping, and never walked at all, during the entire race. I was partly inspired to not walk by the memoir i just finished reading by a famous Japanese novelist and author who is a big runner, Haruki Murakami; i just finished reading the book this very morning, when i woke at 4am and couldn’t go back to sleep, and the words “i never walked, in all of the 20+ races i’ve completed” were with me whenever i considered a short walk to recoup some mojo. The weather was perfect; i ran in shortsleeves, and was never cold, despite the wind and a light rain that came down during the last hour of the race—which was actually very refreshing and i think contributed to my energy levels and confidence (as compared to the heat of Los Angeles, which was my nemesis). Running hard the first 3 hrs was a great decision; rather than acting on fear (of hitting the wall, of running out of juice, of getting cramps) the fast pace gave me tons of confidence, because as I crossed 32km i realized i had a TON of time to make my goal of 4:00:00, and could afford to slow down in the last miles to a much slower pace if necessary—this was a great, great mental edge. Basically, i knew that as long as I didn’t get injured/cramps, i was going to get to my goal of 4hrs, so it became more about how much I was going to smash the time, not whether i would/could. The last 5km i was following some celebrity dude the whole way; i have no idea who he was, but there was a camera crew following him the whole time, and whenever the bystanders saw him and realized who it was, they would do a double-take and then go absolutely bonkers. The girls in particular, some would follow along for a hundred meters screaming hysterically. He looked like an average joe, not a athlete or musician, but who knows… maybe i’ll show up in some photos with him as I was right next to him at times. Being close to celebrity gave me some nice bonus energy. 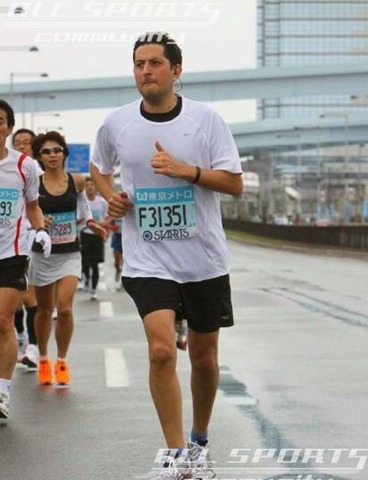 I knew from the course layout that the last 5km had some uphill spots, mostly bridges that we had to run over as we traversed bodies of water in Tokyo bay. These were indeed brutal, bringing me to a slow pace and making me pump my arms HARD, with the added full frontal (20mph per weather report) headwind…. fun! arted to get really emotional. I was looking around in the stands, and all around me, for some sort of connection with the people around me, but it was just 10s of thousands of Japanese nationals. I stated to get really emotional, and after crossing the finish line, and for the next 10 minutes after that as I hobbled around through the detox process (hand in your race chip, get your medal, get a finisher’s towel, oranges and bananas, water, pick up your stuff, change and stretch) i was really really emotional. I never totally lost it, but basically i was on the verge of breaking down into uncontrolled sobs. It was just such an elation, such a momentous achievement, the completion of a lifelong dream to finish in such a great time… and I had NOBODY to share the moment with. I thought of cristina and the kids, of my runner friends, of all the people i wanted to share my happiness with, but I just felt totally ALONE, surrounded by strangers. I looked around for an american to share the moment with, someone to hug or say “great job” or something, but it just wasn’t the right crowd; the few american’s I did see were usually with friends, or women, and I didn’t want to break down and freak anyone out. I eventually talked to a Navy guy who was changing/stretching near me, and we shared a little moment, but by then the emotion had subsided and I kept myself together. So, here’s the news: I ran a sub 3:50:00 time; i won’t know for sure for another day probably. My race time was 3:52:02, but that doesn’t account for the fact that I didn’t cross the startline until at least 3 or 4 minutes after the gun… so I may have done as well as 3:48:00. To put that in perspective, that’s nearly 45 minutes faster than Los Angeles. I completely, utterly, smashed my goal, and I did it while feeling strong and able all the way through. In fact, i know I actually could have left even more of that out there on the track—if not for fear of cramping/etc., i probably could have even done low 3:40s. Alas, nothing to regret, it was an AMAZING race… truly a highlight of life on earth, and definitely the completion of a life long dream, which stated back in 1993 or so when I trained for my first marathon, with a “sub 4hr” goal. To have achieved that, in my late 30s… wow, awesome! Update June 1 2009 – I finally received my final time, via snail mail routed to the USA and then to China: 3:46:16! Well done, dude! I’m doing it in a month’s time; my very first. Just hope to bloody finish it! how did your marathon go?